Black Friday is better than ever! 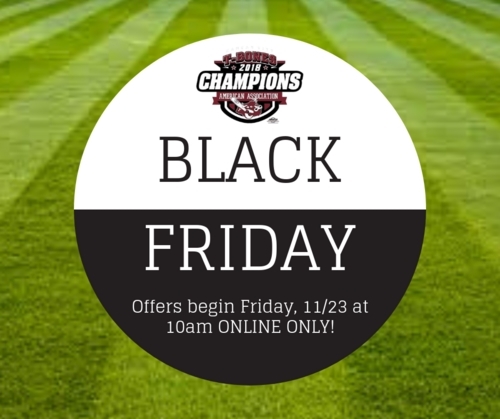 With our schedule just coming out we are getting excited to get the season going with some great Black Friday Deals! We are offering some awesome 2019 Mini Plans with Black Friday Bonuses! Salute to Service Mini Plan- 2 tickets to every Wednesday game, plus 2 FREE tickets to Independence Day game and Military Appreciation game. BLACK FRIDAY BONUS- opportunity to throw out a Ceremonial First Pitch at a 2019 Regular Season Home Game (date TBD)! Starting at just $56! Throwdown Thursday Mini Plan- take in some suds, sun, and Fun...Well Done by hitting the ballpark for every Throwdown Thursday this season with $1.50 beers and $1.50 hot dogs! BLACK FRIDAY BONUS- 2 FREE Vouchers to any 2019 Exhibition Game! Starting at just $42! Family Fireworks Mini Plan- bring the family out for our fantastic fireworks every Saturday night! You are all set with this package, we bring the Fun...Well Done with 4 tickets to each game, one voucher good for (one time use only)- 4 hot dogs, 4 waters/sodas, T-Bones baseball, followed up with a spectacular fireworks display! BLACK FRIDAY BONUS- 4 FREE Vouchers to any 2019 Exhibition Game! Starting at just $244 (for a family of 4)! Senior Sunday Matinee Mini Plan- Seniors 55+ join us for every Sunday Matinee game with 1:05pm first pitch. Enjoy afternoons at the ballpark all summer long. BLACK FRIDAY BONUS- Parking Pass to each Sunday Game + 2 FREE Vouchers to any 2019 Exhibition Game! Starting at just $56! 7 Game Voucher Plan- enjoy discounted rates and flexibility with this Voucher Plan including seven tickets to any 2019 Regular Season Home Game. Vouchers must be exchanged at the Box Office (either in person, or mailed in). BLACK FRIDAY BONUS- 4 FREE Vouchers to any 2019 Exhibition Game! Starting at just $49! 4 Game Voucher Plan- enjoy discounted rates and flexibility with this Voucher Plan including four tickets to any 2019 Regular Season Home Game. Vouchers must be exchanged at the Box Office (either in person, or mailed in). BLACK FRIDAY BONUS- 2 FREE Vouchers to any 2019 Exhibition Game! Starting at just $28! Offer valid Friday, November 23rd at 10:00am through Sunday, November 25th at Midnight.